It’s amazing how one plant extract can potentially do so many things – and the benefits of CBD far outweigh the side effects of CBD. But, before we get into the potential side effects of CBD, let’s remind ourselves as to what CBD is and where it comes from. CBD (also known as cannabidiol) is a natural compound found in the cannabis plant. 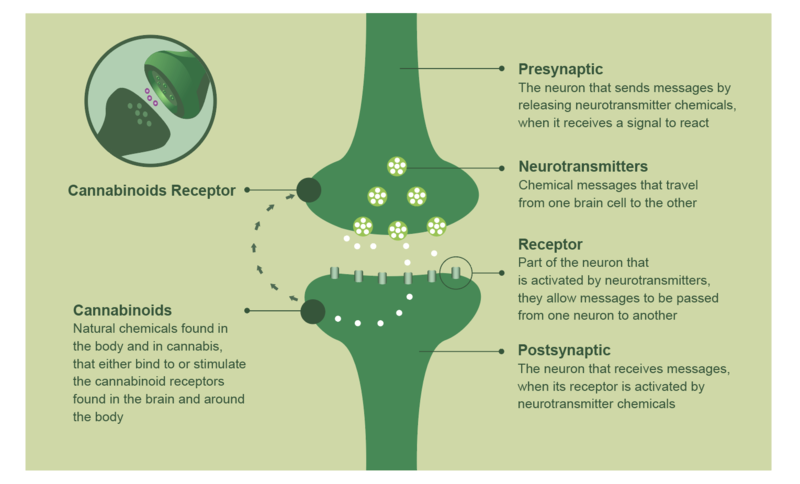 In fact, CBD is one of over 100 compounds that derives from cannabis plants, another being THC. It’s a fair question to wonder how this substance will make you feel. It’s a common misconception that CBD will make you feel ‘high’, like THC. However, CBD is completely non-psychoactive, which means it won’t give you that feeling associated with other strains of cannabis. When CBD is derived from the hemp strain of cannabis, it has less than 0.3% THC, and is considered legal. In the results of our ongoing survey on people who are currently using CBD products, many reported that CBD makes you feel more calm and relaxed – and may even help you deal with daily life issues. What does CBD do to you? CBD works directly with the endocannabinoid system (ECS). If you’re scratching your head as to what this is, then don’t worry. Discovered in the 1990s by scientists, ECS is a complex network of special receptors and cannabis-like chemicals called cannabinoids that collaborate to bring balance to our body and our mind. And, CBD is thought to boost the endocannabinoid system if it has become depleted, or your body’s generally out of balance. The NCBI conducted a review on the ‘Safety and side effects of cannabidiol’. Their verdict? That controlled administration is completely non-toxic and safe in both humans and animals with minimal side effects from CBD hemp oil. It does not affect physiological parameters like heart rate or body temperature. The World Health Organisation has also recognised CBD as being non-toxic, safe and with little to no side effects. So you can add CBD oils to any dish you like or take it daily as a food supplement without any risk. Why not have a play around in your kitchen and combine your CBD oil with different food and tastes to create an exciting new dish that’ll also promote health and wellbeing? Hemp-derived CBD is legal in all US states and most European countries s – so there’s no need to worry whether you could pass a Cannabis drug test as the majority of urine drug screens don’t detect CBD anyway. That being said, it’s thought that CBD stays in your system for two to five days (according to clinical studies performed on patients affected by Huntington’s disease). However, the amount of time for the molecule to completely leave the human body depends on each person – as well as the quantity of CBD taken. However, it’s important to be informed of the potential CBD effects before you incorporate it into your routine. While only minor, it’s also important to remember that CBD can affect everyone differently and what might happen for one person might not be the same for you. So it’s important to not go too crazy when you first start taking CBD. Instead, start with a low dose and gradually build up. If you notice any side effects, simply lower the dose again. Dry mouth Although only a mild consequence that is likely to make you thirsty more than anything, mouth dryness, or ‘cotton-mouth’ is a potential side effect of hemp oil and CBD administration. This is because – as a 2006 study suggests – cannabinoid receptors are present in the submandibular glands, which are responsible for producing saliva. This means that when CBD gets involved with the endocannabinoid system’s process, saliva is unable to be produced. A small drop in blood pressure When CBD oil is taken in higher doses, a small drop in blood pressure is one of the potential CBD hemp oil side effects. This usually happens within a few minutes as the CBD enters your system and is not permanent. However, we recommend consulting your doctor before taking CBD if you are taking medication for blood pressure. Lightheadedness This is often caused by a drop in blood pressure when taking high doses. However, this effect is only temporary and can usually be resolved by having a tea or coffee. Increased tremor in Parkinson’s disease (only with high dose of CBD) Early research around CBD initially suggested that those with Parkinson’s disease may experience worsened tremors and muscle movement when taking CBD in very high doses. However, more recent studies have also claimed that cannabidiol is safe for use by patients with Parkinson’s disease. Either way, we recommend consulting with your doctor before taking CBD and to begin taking small doses. If this side effect occurs, the dose can be reduced to lessen the chance of this potential side effect. Drowsiness It’s been suggested that CBD is a wake-inducing agent. However, in higher doses, CBD can affect people differently and cause drowsiness. If you experience this side effect, do not drive or operate heavy machinery — and simply reduce the dose you’re taking. While scientific studies and clinical trials are still taking place, it’s been suggested that CBD can have positive health benefits on our body. These include: The possibility to relieve pain The possibility to reduce inflammation The possibility to reduce anxiety The possibility to help to fight cancer The possibility to treat some neurological disorders and seizures The possibility to relieve nausea The possibility to promote good sleep/ help with insomnia The possibility to promote cardiovascular health For more information around CBD benefits on our body, don’t hesitate to read our resource here. If you’re still wondering what CBD is all about, why not head over to our CBD online shop and grab one of our amazing products? You can also send us a message via our chatbot or drops us an email — our support team will be happy to help you make an informed decision.